When the world needs a musclebound cinematic hero, they... More turn to the likes of Sylvester Stallone and Arnold Schwarzenegger, but when the world needs a fearless, real-life hero against the likes of Dr. 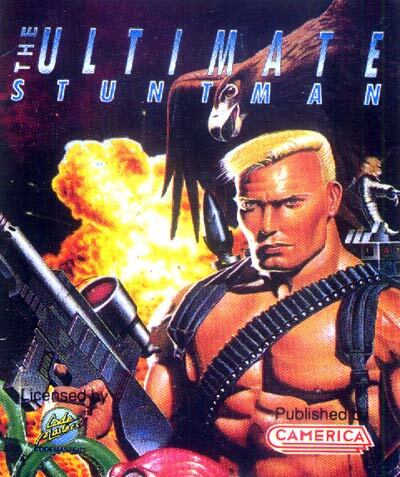 Evil, they turn to the equally musclebound Ultimate Stuntman. In pursuit of the aptly named Dr. Evil who's kidnapped the beautiful and brilliant scientist Jenny Aykroyd, Ultimate Stuntman's journey to rescue her will take him through an array of perilous adventures across the world. Of course, Dr. Evil isn't going to let himself be captured without first putting up a fight, so he's not only got an army of robot thugs on the lookout for Ultimate, but has created powerful and massive androids such as Techno Beast and Slug Master who are waiting for him at the end of each mission. Each level that Ultimate fights his way through are made up of different dangers he must brave, sometimes taking place in a new location or driving a different vehicle, but consisting of the same basic theme. Starting off in an overhead perspective ground pursuit, Ultimate races his car through highways and back roads, chasing Dr. Evil while avoiding roadblocks, barrels, debris and other vehicles, jumping ramps and collecting power-ups. Power-ups allow you to increase your fire from one shot, up to three shots thus covering a wider area, or a powerful spiral shot.